American Locomotive Company, “Steam Locomotive Installation at the National Museum of American History,” Histories of the National Mall, accessed April 25, 2019, http://mallhistory.org/items/show/488. 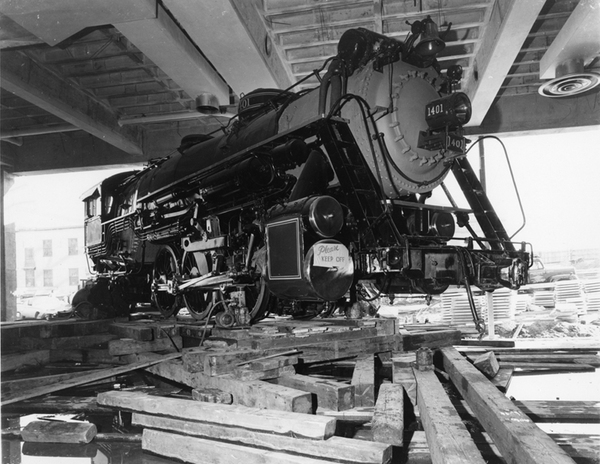 The American Locomotive Company of Richmond, Virginia built this 280-ton passenger stream train in 1926 which arrived at the National Museum of History and Technology (now the National Museum of American History) to go on permanent display in the Railroad Hall. The retired rail car entered the museum during the original construction, on custom-built train tracks that led directly into the building. Once inside, the exterior museum walls could be completed.